Fall really came in with a bang this year. One week, we were having the most gorgeous warm evenings of the entire year, then the next week it rained. And rained. And the wind started blowing. Then it hailed. So much for summer. At least the leaf colors have been fabulous this year, when it stops raining enough to see them. On the down side, we’ll miss the grill. But on the plus side, we can get going on the braises, the roasts, and casseroles, and the squash and greens. I love the first really seasonal food of any time of year, whether it’s the first asparagus of spring, the first cold noodle salad of summer, or the first batch of holiday cookies. Because we try not to buy out-of-season produce (much), it makes it all the tastier when its time does come. On our last couple of forays to Dunbar Gardens we’ve bought Delicata squash, leeks, Burgundy apples, lettuce, poblanos, tomatoes and chard. At the farmer’s market we’ve gotten potatoes, cheese, cauliflower and eggplant. Eventually the farmstand and market will close for the winter and we’ll be free to buy brussels sprouts and sweet potatoes at the store, and they will seem like a treat because we’ve been waiting for them. 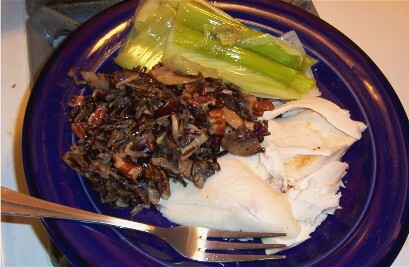 Last night, in the spirit of autumn eating, I roasted a chicken with fresh bay leaves stuffed under the skin, braised some fresh leeks, and we made one of our favorite autumnal side dishes, wild rice sauteed with lots of mushrooms, dried cranberries and chopped pecans. This turned out so good! The leeks were a little tough and stringy, I’m sure I should have trimmed them down a bit more. But they tasted good. This was a lovely warming dinner, along with a bottle of Domaine Massamier la Mignarde, a slightly fruity red wine. Too bad we finished off the pear pie already.